Everyone wants to be remembered. Whether it is through enduring fame, important works, or through friends and family, there is something innately human and the desire the continue on after we're gone. To have mattered. To have made a difference. "Found footage" is a term that has come to define a subgenre of film where "home video" footage is used to tell a story as if it was captured by the characters as it happened. The footage isn't actually "found" of course, it was shot by professional filmmakers for the purpose of making a movie out of it. 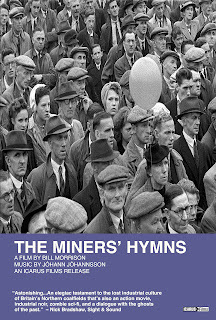 Bill Morrison's The Miners' Hymns, on the other hand, is the true definition of a "found footage" movie. 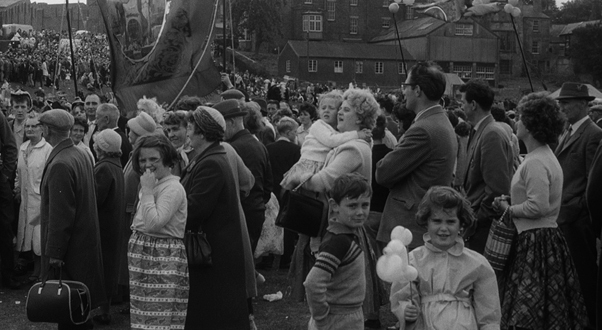 Morrison has taken archival footage of British miners and turned it into something new, a haunting and poetic testament to the passage of time and the burning desire to be remembered. Juxtaposing the black and white archival footage with arial color shots of the same locations as they look today, The Miners' Hymns creates a kind of elegy for a vanished way of life. It's a meditation on the passage of time and the unstoppable march of progress, even if it doesn't always lead somewhere we want to go. The miners' struggle - at work in the mines, for better working conditions, for recognition in the face political turmoil, provides the backbone of the film's silent narrative, which ranges from the early 1900s to the 1980s, encapsulating a century's worth of change. It is somewhat reminiscent of Terrence Davies' Of Time and the City, but without the overly purple narration that I found so problematic. The Miners' Hymns is completely silent, save for Jóhann Jóhannsson's powerful score. It is a film of images and feelings, of textures and emotions. It creates impressions from seemingly mundane footage of gatherings of workers, of miners working, of children running up and down rock piles, and makes them endlessly engrossing. By the time we reach the final scene, of a parade of workers marching down the street in a parade of solidarity, Morrison has creating something both moving and enchanting, a beautiful and lyrical marriage of image and music that creates a deeply profound portrait of the fleeting nature of time. Most of the people we see in this old reels are dead now, their names lost to the ever shifting sands of time. But here we have their images, their careworn faces conveying a lifetime of stories of which we can only speculate. It's a fascinating work, at once timeless and ancient, symbolic of the never ending march of time and its effect on the landscape and the people who shape it. Part documentary, part found object art, The Miners' Hymns is a remarkable achievement. 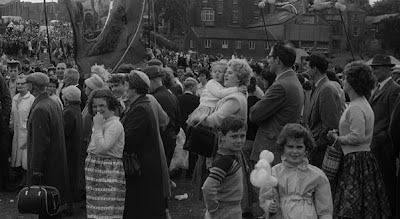 It's an insurance that these faces will never be forgotten, their careworn visages frozen in time, their struggle immortalized in the now unrecognizable landscape that may have bulldozed over the last traces of their existence, but whose very presence represents decades of work and struggle. It's a fantastic paradox that's as thrilling to experience as it is to contemplate. There's nothing else out there quite like it. 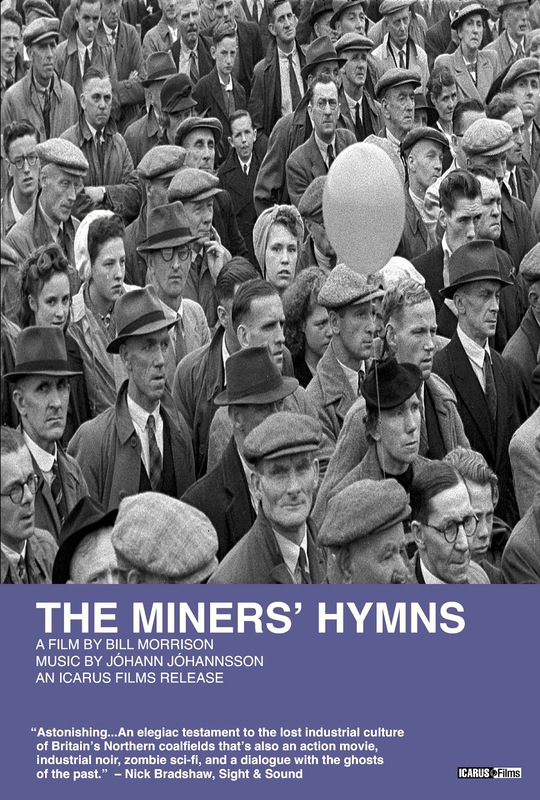 THE MINERS' HYMNS | Directed by Bill Morrison | Not rated | Now playing at the Film Forum in NYC along with 3 short films by Morrison - RELEASE (2010), OUTERBOROUGH (2005), and THE FILM OF HER (1996).